Series pumps with solar cells and covered with solar cells equipped. Set the solar panel with a full set can be installed manually. Even without knowledge of electricity. Just tell your usage needs. The team of engineers to help design solar cell system is appropriate. Worth the investment Long available The equipment that we used in the system tested by a reasonable period both practical field-oriented actual use by engineers as a control. Focus actually works to benefit the many customers as possible. When customers receive exceptional value makes the delivery of a team of over a hundred. The percentage is considered to deliver production Phand. Quality is key to the market's top team, you can visit Sun Energy work. shop , renewable energy resources and products based on the website and delivered a series of solar cells consists of a complete set of equipment can be used. Suitable for use in areas lacking electricity. Do not drag a line far longer farm house in rubber plantation, farm ponds can be installed on light bulbs, TV, water pump for pumping water for agriculture. Can help reduce global warming pollution because it is clean energy. You can start at the Do not worry, I will not buy. Or have a problem after deployment. We have a team of consulting engineers after sales throughout its lifespan. Each kit consists of a device. solar panel Solar battery chargers, inverters or power adapter and accessories for applications such as water pumps for pumping. With light or more can be obtained from the Engineer hot line operation of solar cells that can be installed manually. The principles are as follows: The solar panel will convert solar energy into electrical energy. The solar panel will range from small to large 5 ..100W..140W 150W 250W 280W 40W 30W W 10W20W 300W..320W to. Selection is based on the demand for the deployment of the system. Equipment Solar charger or battery chargers. Acts charged ions from the solar panel to the battery. The size of the battery charger will be called. AMP (Amp) followed. With V 12/24/48/96 devices such as capacitors for use at night or when there is no sunlight. Called battery In a series of solar cells in 2015, the engineers used battery type for solar cell system, specifically the battery Discovery Syed's Miracle Deep cycle 35A 45A 80A 120A 130A 150A 200A so that the system is stable and active. prolonged The device is a power converter, known as inverters or transformers. Will convert electricity from direct current to alternating current. The size of the selection by the appropriate use of the loading of the solar system. Solar water pump sets for pumping groundwater single panel version of Sun's Energy to pump water deep underground or to send water to within a distance range of less than 30 meters should be advised not to install it manually. Use the solar panel 250. Just one watt panel Lifetime more than 25 years, does not require batteries. The pump motor does not have to be converted to charcoal. 3 year factory warranty, with the MPPT controller (Maximum power point tracking) control system with DSP Digital signal processing enables accurate signal work. The processing motor consumes less power. The system checks the water level in wells by a sensor. Check the height of the water. When the water stops running dry To prevent damage to the motor of the pump. Or when a full tank of water will float switches, water pumps, water level monitoring. Stop working as well in case the water is full. A tube LED indicator. Power from the solar panel MPPT mode of operation of the water level in the pond. The water level in the tank Suitable for pumping in Grange Park mixtures farm houses, factories, offices, resorts, work still quiet, durability and long Gaa. Installation, then do not pay electricity and gas bills anymore. With a team of engineers on hand to advise active throughout the lifespan. Solar water pump sets for pumping groundwater single panel version of Sun's Energy to pump water deep underground or to send water to within a distance range of less than 40 meters should be advised not to install it manually. Use the solar panel size 300. Just one watt panel Lifetime more than 25 years, does not require batteries. The pump motor does not have to be converted to charcoal. 3 year factory warranty, with the MPPT controller (Maximum power point tracking) control system with DSP Digital signal processing enables accurate signal work. The processing motor consumes less power. The system checks the water level in wells by a sensor. Check the height of the water. When the water stops running dry To prevent damage to the motor of the pump. Or when a full tank of water will float switches, water pumps, water level monitoring. Stop working as well in case the water is full. A tube LED indicator. 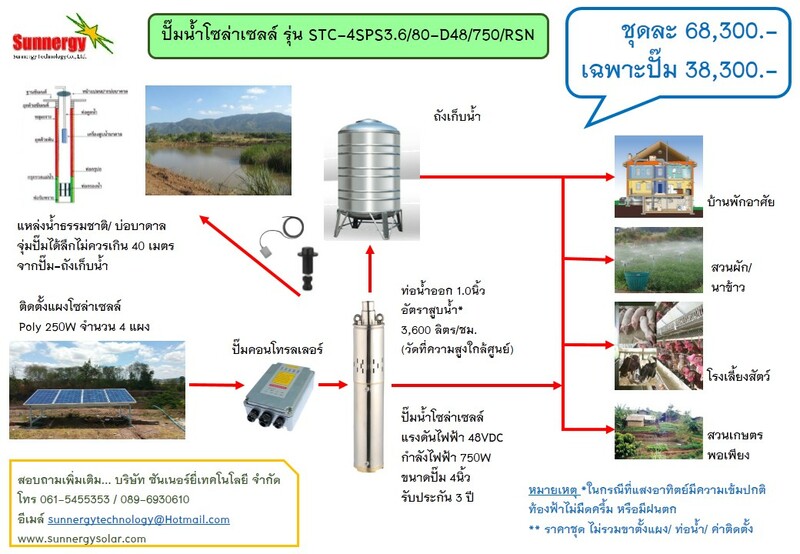 Power from the solar panel MPPT mode of operation of the water level in the pond. The water level in the tank Suitable for pumping in Grange Park mixtures farm houses, factories, offices, resorts, work still quiet, durability and long Gaa. Installation, then do not pay electricity and gas bills anymore. With a team of engineers on hand to advise active throughout the lifespan. Solar water pump sets for pumping groundwater second generation Sun Energy panels for pumping groundwater pumping water deep or want to send a short distance, the distance should not exceed 50 meters slack guide is easy to install yourself. Using a 250 watt solar panel two panel lifespan more than 25 years, does not require batteries. The pump motor does not have to be converted to charcoal. 3 year factory warranty, with the MPPT controller (Maximum power point tracking) control system with DSP Digital signal processing enables accurate signal work. The processing motor consumes less power. The system checks the water level in wells by a sensor. Check the height of the water. When the water stops running dry To prevent damage to the motor of the pump. Or when a full tank of water will float switches, water pumps, water level monitoring. Stop working as well in case the water is full. A tube LED indicator. Power from the solar panel MPPT mode of operation of the water level in the pond. The water level in the tank Suitable for pumping in Grange Park mixtures farm houses, factories, offices, resorts, work still quiet, durability and long Gaa. Installation, then do not pay electricity and gas bills anymore. With a team of engineers on hand to advise active throughout the lifespan. Solar water pump sets for pumping groundwater model four panels Sun Energy to pump water deep underground or to send water to within a distance range of less than 100 meters should be advised not to install it manually. Using a 250 watt solar panel 4 panel lifespan more than 25 years, does not require batteries. The pump motor does not have to be converted to charcoal. 3 year factory warranty, with the MPPT controller (Maximum power point tracking) control system with DSP Digital signal processing enables accurate signal work. The processing motor consumes less power. The system checks the water level in wells by a sensor. Check the height of the water. When the water stops running dry To prevent damage to the motor of the pump. Or when a full tank of water will float switches, water pumps, water level monitoring. Stop working as well in case the water is full. A tube LED indicator. 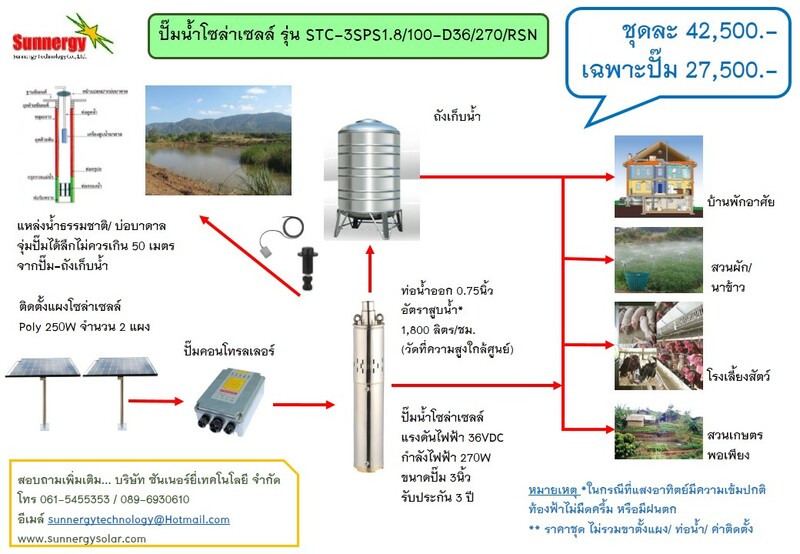 Power from the solar panel MPPT mode of operation of the water level in the pond. The water level in the tank Suitable for pumping in Grange Park mixtures farm houses, factories, offices, resorts, work still quiet, durability and long Gaa. Installation, then do not pay electricity and gas bills anymore. With a team of engineers on hand to advise active throughout the lifespan. Series pumps solar cells to pump groundwater model four panels Sun Energy to pump groundwater pumping depth or to send water to the distance stage erectile recommend no more than 80 meters in length at about 40 meters away. The flow rate was good. Easy to install yourself Using a 250 watt solar panel 4 panel lifespan more than 25 years, does not require batteries. The pump motor does not have to be converted to charcoal. 3 year factory warranty, with the MPPT controller (Maximum power point tracking) control system with DSP Digital signal processing enables accurate signal work. The processing motor consumes less power. The system checks the water level in wells by a sensor. Check the height of the water. When the water stops running dry To prevent damage to the motor of the pump. Or when a full tank of water will float switches, water pumps, water level monitoring. Stop working as well in case the water is full. A tube LED indicator. Power from the solar panel MPPT mode of operation of the water level in the pond. The water level in the tank Suitable for pumping in Grange Park mixtures farm houses, factories, offices, resorts, work still quiet, durability and long Gaa. Installation, then do not pay electricity and gas bills anymore. With a team of engineers on hand to advise active throughout the lifespan.